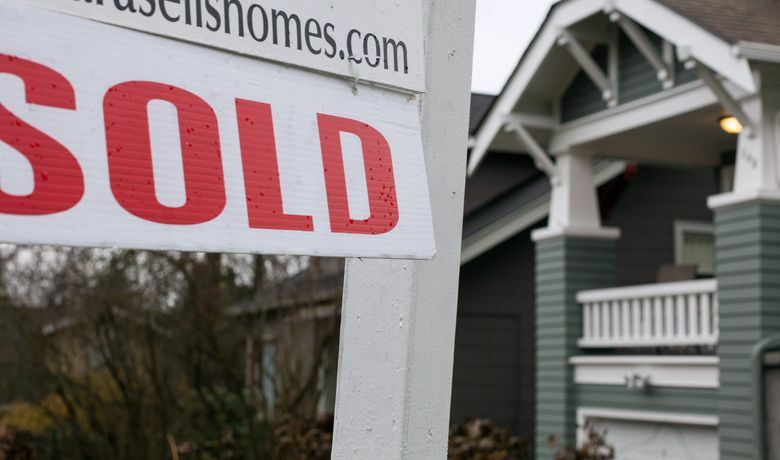 The number of homes for sale across King County surged up 66 percent in the past year — and 86 percent just in the city of Seattle — the biggest rise in more than a decade. Home prices are continuing to fall across an unseasonably cool Seattle real estate market, with homes that would have been snapped up in an instant just several months ago now sitting unsold. New monthly data out Friday shows median home prices across King County fell $30,000 in August from the month prior, the third straight month of declines. 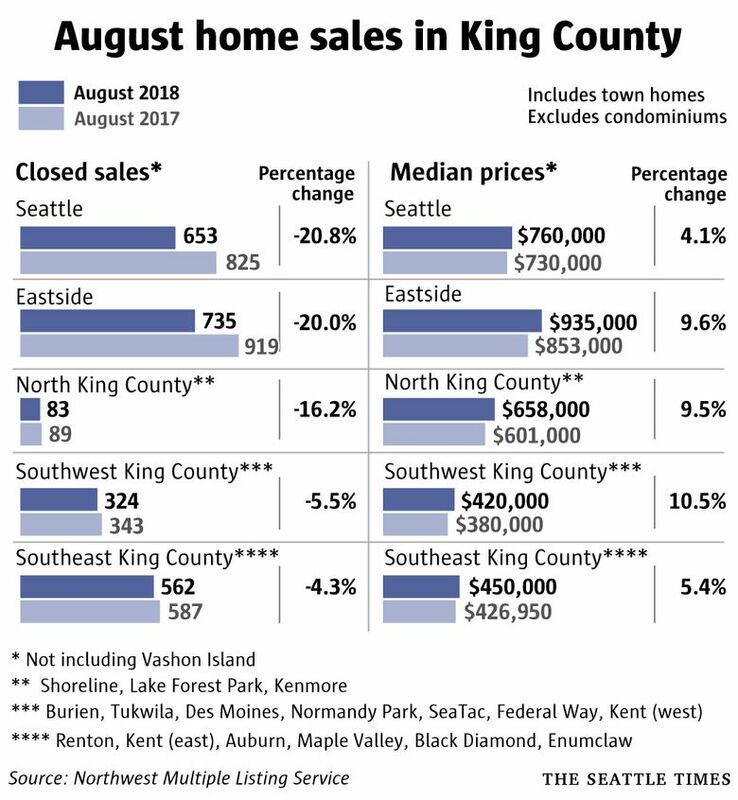 Countywide the median cost of a single-family house, now $669,000, is down by $57,000 since May, according to the Northwest Multiple Listing Service. The drop runs counter to normal seasonal patterns: During the same three-month period last year, prices actually went up by $16,000. Looking just at the city of Seattle, the change is even more pronounced: The median house last month sold for $760,000, a drop of $45,000 in just one month and $70,000 in three months. Compared to a year prior, prices are still up 2.9 percent across the county, but that was the smallest increase in four years. It’s a far cry from the double-digit growth that had become the norm over the last few years. There’s more encouraging news for homebuyers who have dealt with years of frustration: The number of homes listed for sale is up 66 percent from a year prior across the county, the biggest jump in more than a decade. Inventory has grown in a big way for several months in a row now and has returned to 2014 levels, wiping out four years of declines. Again, the trend is even more dramatic in the city of Seattle, where inventory for single-family houses shot up 86 percent from a year prior. During that same period the inventory of Seattle condos skyrocketed 161 percent. The surge in listings is not the result of new homes coming on the market, but rather because houses are sitting unsold for longer. In turn, that has prompted a jump in the number of sellers cutting their list price, which would have been unheard of earlier in the year. The drop in demand is part of a national trend as home prices – combined with higher mortgage rates – hit a point where fewer and fewer people can afford them. The fact that Seattle-area rents have stopped growing this year has put less pressure on buyers, as well. Local population and job growth has also slowed in recent months. And reports indicate buyers from China, who have a strong presence in the Seattle market, have had trouble getting their money out of the country amid growing restrictions there, leading to fewer home bids here. “Things have certainly changed,” said John Manning, owner of a RE/MAX brokerage in Ballard. Some buyers are making requests for concessions that they “wouldn’t have dared to offer” just a few months ago. “One group is just sitting back and saying I want to see what happens” and putting their home search on hold, he said. “The second group is very much launching into, ‘We’re going to negotiate far harder.’ And the third group of people are slowing down a bit, and taking more time to consider” before making a bid. 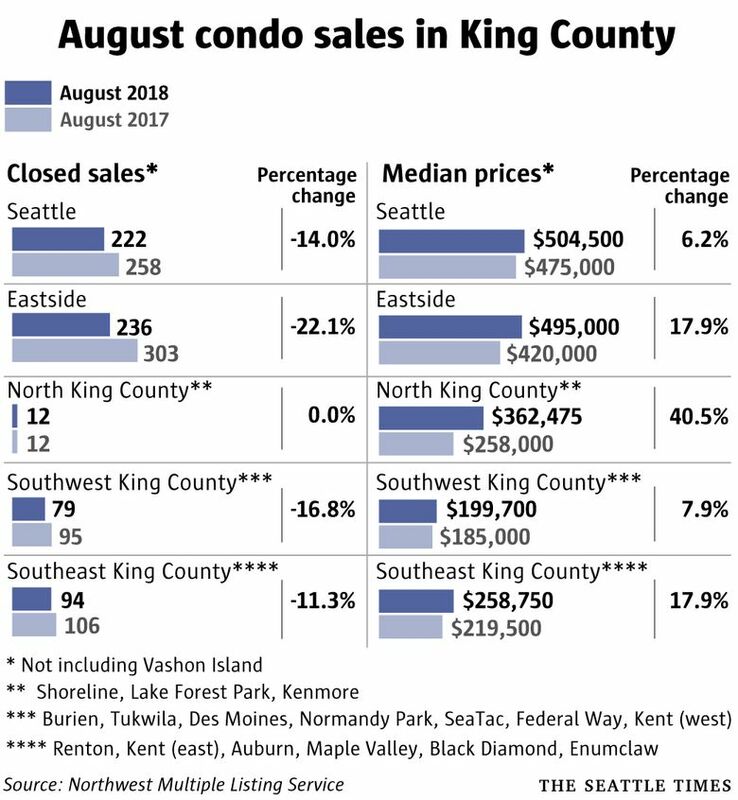 Neighborhood-level data is more volatile, but in the past three months, median prices have dropped $397,000 in Kirkland-Bridle Trails, $125,000 in East Bellevue and $87,000 in Southeast Seattle. And they’re down more than $70,000 in the past three months in Queen Anne/Magnolia, Ballard/Green Lake, and Shoreline/Richmond Beach. On the other hand, since the spring prices are actually up by $202,000 in West Bellevue (the region’s priciest submarket), and have grown by $40,000 in Mercer Island (the second-priciest area) and by $50,000 in Des Moines-Redondo. Just about every year, prices drop a bit through the fall and winter. If that pattern repeats, then the region would be in for even more price reductions over the next several months. Seattle’s housing market has cooled more in recent months than any other metro area in the country, according to Zillow. Just recently, prices were rising faster here than anywhere else; now, Seattle is 12th on a list of the biggest 35 metro areas. Washington state was also recently dethroned as the state with the fastest-rising home prices. Washington had led all states in home price growth for about a year and a half, while Seattle had led all metro areas in home price growth for nearly two years. In all, prices here have roughly doubled since the market bottomed out in 2012. The recent turn in the market has only made a relatively small dent in that: Seattle remains one of the most expensive places in the country to buy a house, having passed the likes of Los Angeles, San Diego and New York in recent years. Brokers quoted in a release from the listing service noted that in recent months, there have been fewer bidding wars, while buyers are taking more time in deciding what to purchase. Even some new-home construction builders are dropping list prices. John Deely, a director for the listing service and principal managing broker for Coldwell Banker Bain in Seattle, said buyers have returned to requiring contingencies based on home inspections and other factors when they make an offer. Earlier, when the market was more competitive, it was standard for buyers to waive virtually all their contingencies – agreeing to buy the house even if an inspection turned up problems – to win a bidding war. Mike Grady, president and COO of Coldwell Banker Bain, said sellers “may have overpriced their homes in the spring and early summer and now have to adjust their asking price.” But sellers have begun adapting to the changing market more recently with more realistic pricing, he said. Pricing in the condo market is a bit more of a mixed story. The median condo across the county sold for $415,000 last month, down from the record of $466,000 in the spring but still up 11.3 percent from a year prior. Things have cooled a bit in surrounding counties, as well, but not by nearly as much. 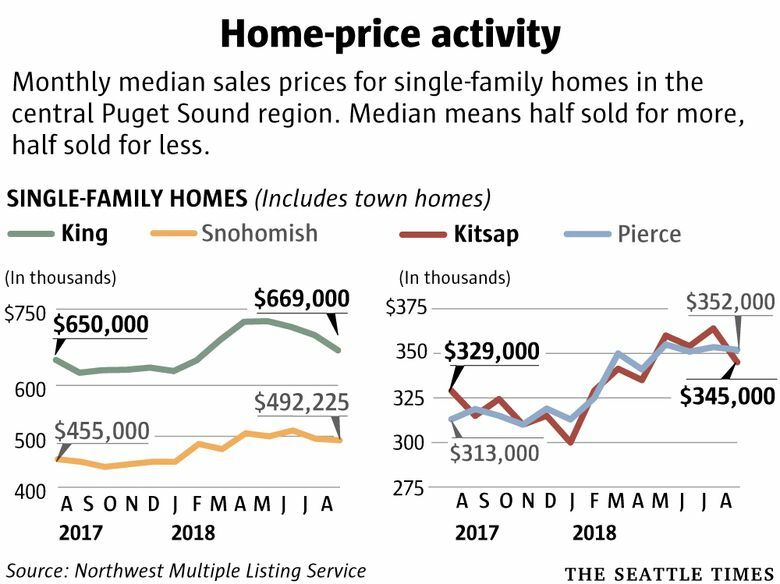 In Pierce County, houses cost a median $352,000, up 12.5 percent in the past year and just a few thousand bucks off from the peak level reached in the spring. And Kitsap County prices settled at $345,000, up 4.9 percent in the past year but down from the record of $364,000 a month prior.